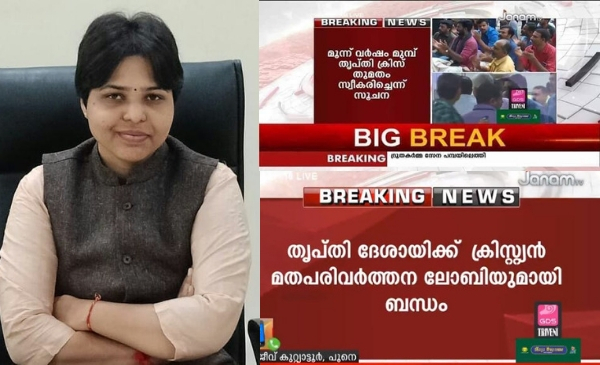 Malayalam TV channel Janam TV, which has been called out in the past for sharing misinformation over the women trying to enter the Sabarimala shrine, has done it again; this time claiming, activist Trupti Desai secretly converted to Christianity. Furthermore, the source of Janam TV’s wild allegation appears to be a Bharatiya Janata Party worker. Even as the drama played out at the Cochin airport on Friday which finally resulted in Desai returning to Mumbai, social media was rife with misleading and divisive claims about Desai’s religion and political affiliation. While Trupti has not been answering BOOM’s calls, her husband Prashant Desai denied the claim. BOOM also contacted the BJP worker who refuted that he ever gave any such information to Janam TV. ‘Trupti Desai, a Christian and stooge of Missionaries’? 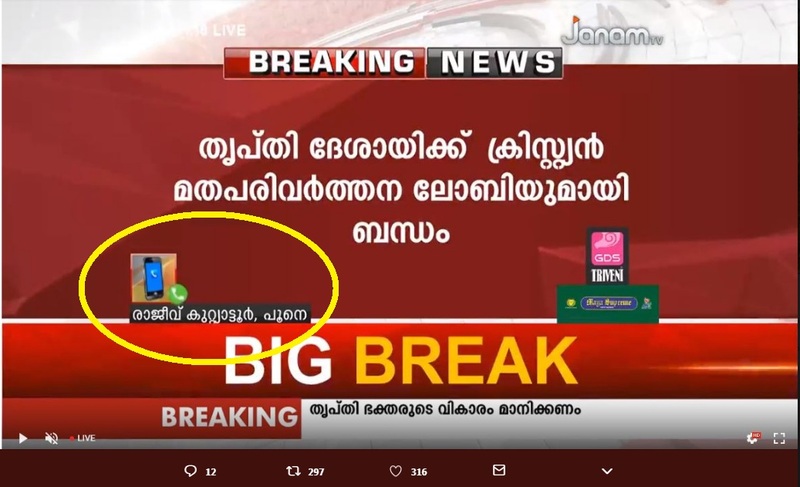 While this claim was circulated on social media since the past two days, JANAM TV – a Malayalam news channel reported this as Breaking News, starting Thursday evening. A video clipping and a graphic of Janam TV which says Desai is a Christian are being shared widely on social media. Moreover, it also claims that Christian Missionaries are behind Desai’s attempt to undertake the trek and pray at the shrine. The Janam TV show graphic (as shown below) said, “Trupti Desai connections with Christian conversion lobby” and the next one claimed that the TV channel has received information of Desai having converted to Christianity 3 years back. Below is the video clip of Janam TV reporting the same posted by Facebook page UdayaBharathamഉദയ ഭാരതം . Another video posted by UdayaBharathamഉദയ ഭാരതം has the caption, “Trupti Desai, a woman who accepted Christianity.. Janam TV Break, Christian Missionaries not leaving Sabarimala… Janam TV Break, John’s – The Cross at Airport Nilakkal, The fire at Sabarimala, everything is linked, do you understand the game? BOOM spoke to Vineesh V, Trivandrum Bureau chief of Janam TV who said that they received the information from Mr Rajeev Attoor, Trupti Desai’s ‘neigbhour’ in Pune. He said Attoor is the president of Navodaya Charitable Trust in Pune. However, Janam TV’s graphic shows ‘Rajeev Kuttyattoor, Pune’ was on call. BOOM pointed this out to Vineesh who said that he was informed that the source is Rajeev Attoor. 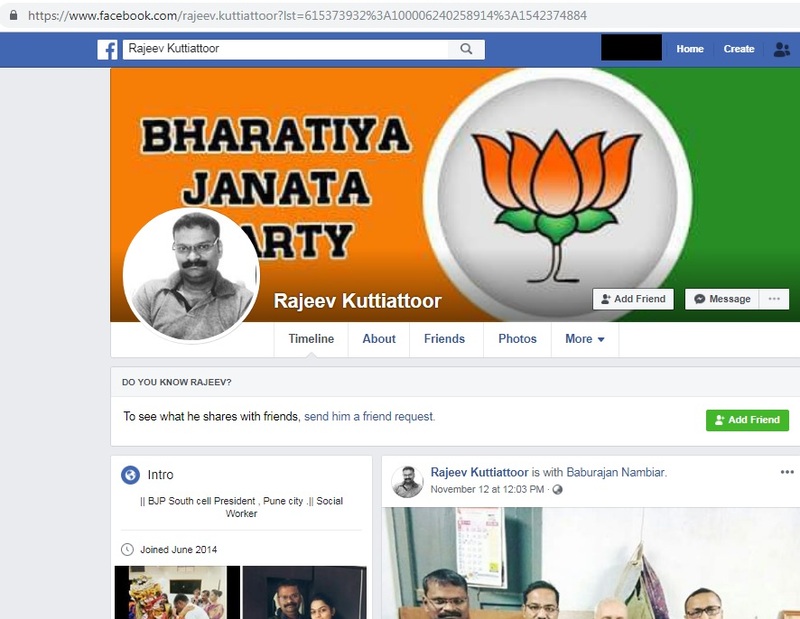 BOOM traced Rajeev Kuttiattoor’s Facebook profile. Interestingly, according to Kuttiattoor’s Facebook profile, he is the BJP’s South Cell President, Pune. The photos given below found on his Facebook profiles can see mentions of Navodaya, Pune. 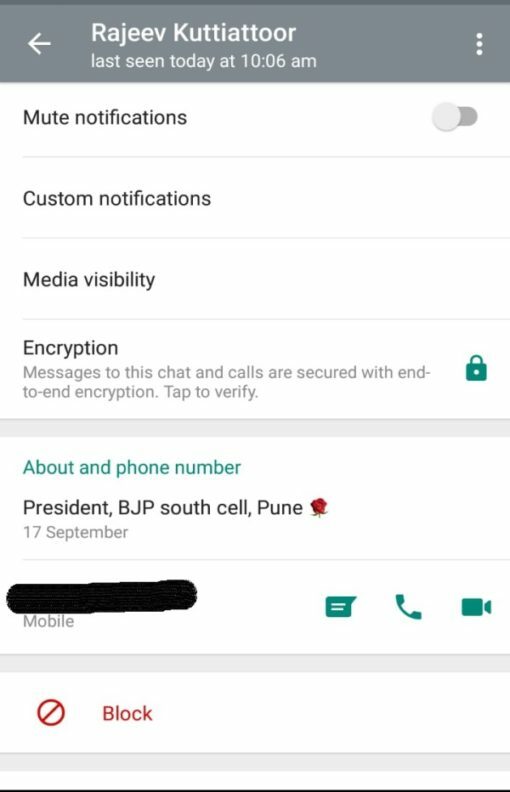 Kuttiattoor’s WhatsApp status also says, “President, BJP south cell, Pune” and was updated September 17 this year. When asked whether he was present at the airport to witness Desai leaving, he said, “No, I was not present but my friends were and they informed me about it.” Kuttiattoor added that he had not made any comments about Desai being a Christian to Janam TV. 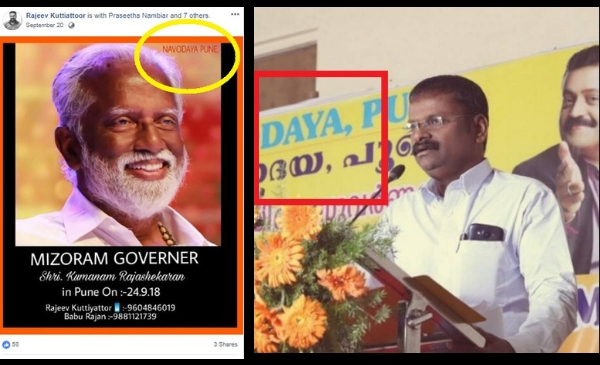 “I did not say anything like that.” When asked whether he runs a charitable organisation called Navodaya, Kuttiattoor confirmed the same. But when BOOM asked him if he was the President of BJP South cell as claimed on his social media accounts, Kuttiattoor refused to comment further. BOOM has not been able to contact Janam TV for their reaction to Kuttiattoor’s denial. Despite the strong denials, BOOM found that the claim was being circulated on social media in the form of memes, videos and posts, citing Janam TV as the original source. A verified Twitter handle @MeenaDasNarayan , followed by several BJP leaders including Prime Minister Narendra Modi, tweeted the same citing Janam TV. Her tweet has been retweeted over 2000 times. Her Twitter bio says that she is ‘Editor-in Chief of Gulf Connoisseur’ and ‘Vice President of VHS Karnataka’. Ok truth out #TriptiDesai converted to christianity three years back..in 2013..closely connected to conversion racket…she is a CHRISTIAN in hindu garb…beware keralites..come to destroy #Sabarimala #JanamTV report exposes this..
She later tweeted that Desai’s real name is ‘Tripti Isabel Desai’. Another video that is being shared is a Facebook post by one Dr N Gopalakrishnan (@iihsteam). In the video he is heard saying that Trupti Desai is a stooge of the Christian missionaries to make Sabarimala a riot ground. He say that Janam TV has provided evidence from Delhi and Pune that she is a Christian missionary. Gopalakrishnan’s bio shows that he is a former scientist at Council of Scientific & Industrial Research (CSIR). The Facebook profile is linked to a site called Indian Institute of Scientific Heritage. 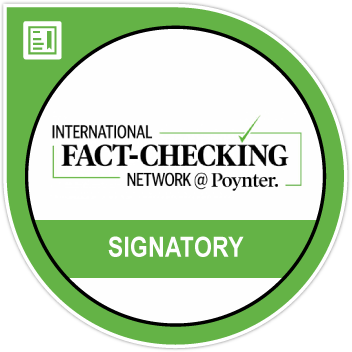 The Twitter bio of the site says that IISH is registered as a charitable trust. A website named dharmamessages.in has profiled IISH which says it has undertaken “the mission of learning and teaching the ultra ancient heritage of Bharath (India) using ultra modern scientific and technological tools”. Another set of Facebook posts claim that Trupti Desai’s real name is ‘Trupti Joseph Desai’. ‘Trupti Desai – a friend of the BJP’? But it was not just the right wing that suspected Trupti Desai’s intentions of attempting to reach Sabarimala. Facebook pages supporting the CPIM claimed her visit to Kerala was a conspiracy by the RSS and the BJP. 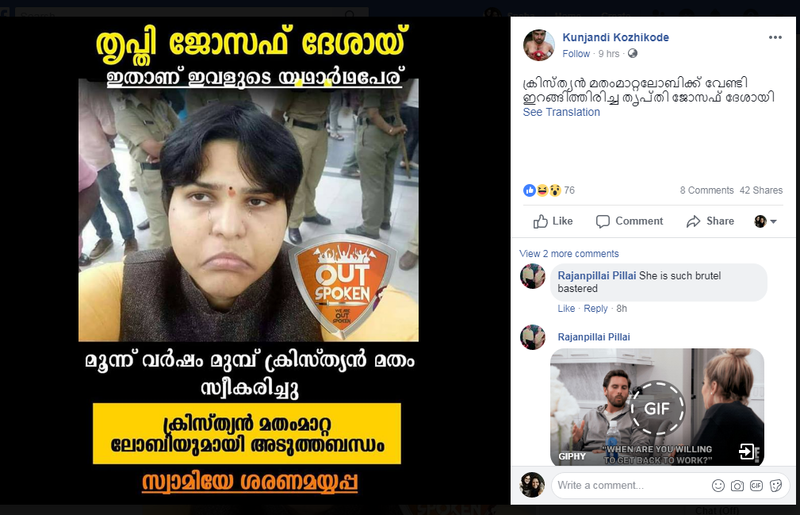 This post by Facebook page CPIM Commandos has used HMTV – a Telugu news channel’s logo in the news template and claims Trupti Desai said that she is going to Sabarimala on BJP National President Amit Shah’s instructions. The post claimed that Trupti met Shah during the Rajasthan election campaign. Another Facebook post said – ‘Sanghi’s loved friend – Trupti Desai’. This is not the first time religious motives have been linked to Trupti Desai’s interest in Sabarimala. After the Supreme Court’s verdict on Sabarimala, a video of Desai being felicitated by a group of people including Muslims was shared online with a misleading caption. The caption claimed that Muslims were behind the petition to scrap the centuries old diktat of barring women of menstruating age from entering the Sabarimala Ayyappa Temple in Kerala. Click here to read the story. Trupti Desai is the founder of Bhumata Brigade, a Pune-based social justice organisation, and has been one of the few women at the forefront to ensure gender equality at places of worship.